If you want to celebrate a former US President for Halloween, you can dress up as the former President Ronald Reagan who is known for accomplishing many different achievements in his lifetime (February 6, 1911 – June 5, 2004). He was originally a Hollywood radio star and then became a film actor. Later on, he was elected as the 33rd Governor of California (1967–75) before becoming the 40th United States President (1981–89). 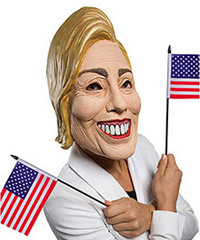 If you want to play homage or celebrate this late President during the Halloween season, check out the Halloween masks we have listed below and choose the one you like the best. 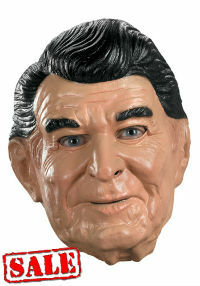 There are even parody masks such as the popular Frankenstein and Zombie Reagan masks for Halloween! The Halloween mask is an over-the-head latex mask with realistic details such as life-like coloring, textured latex hair, and wrinkles with expression lines. This mask fits most adults and older teens. 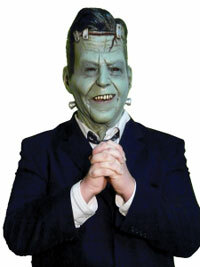 Add a comedic Halloween twist to your costume with this Frankenstein version of Reagan. 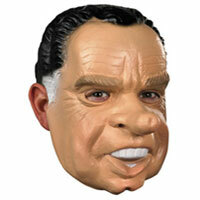 This "Reaganstein" mask is a full over the head latex mask painted in great detail. 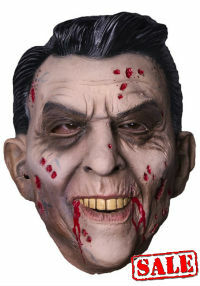 Disguise yourself as the zombie version of President Reagan with this detailed mask.